Succulent lamb and an assortment of brightly colored vegetables. Delicious [and expensive!] 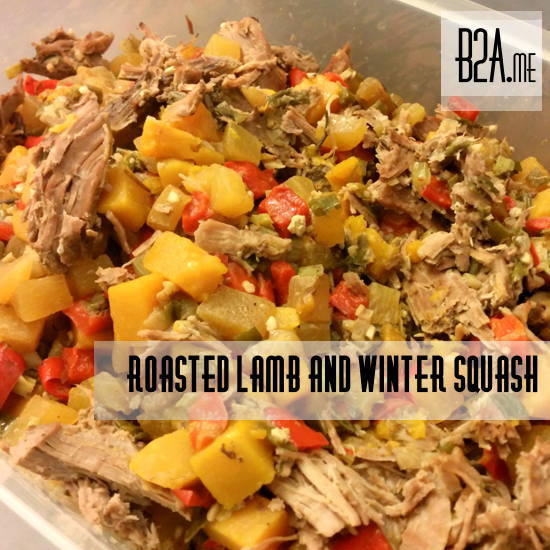 leg of lamb used to flavor a bit of winter squash. 1. Cube winter squash, dice bell peppers, chop green onions. 2. Toss vegetables into crockpot and coat with 3 tbsp Dijon mustard, 3 tbsp garlic, and 1 tsp rosemary. 3. Toss leg of lamb on top of vegetables; coat with remaining mustard, garlic, and rosemary. 4. Cook for 8 hours on low.